The Namesake: good as a movie; better as a novel. Stars Warren Beatty and Julie Christie were lovers at the time of filming; this was their first time working together on a film. The film was shot almost entirely in sequence; the order it plays is the same order in which it was shot. The film negative was "flashed" (exposed to light) in order to get a grainy, lived-in look. Leonard Cohen's music was added to the film in post-production, and though he was a personal fan of Altman and gave him permission to use the songs, Cohen disliked the finished film upon first viewing. A year later, he called Altman and told him that after seeing the film again, he'd had a change of heart and realized he loved it. McCabe & Mrs. Miller is not your typical love story, nor is it your typical western, but it is your typical Robert Altman film. It features the trademark Altman ensemble feel, overlapping dialogue, and genre subversion to which fans of the director have become accustomed. What is new and interesting (at least to me) is seeing these techniques used in a Western. In many ways, the genre suits Altman incredibly well; his realistic, unvarnished approach serves to bring out the ruggedness of the old west, the way things actually were, rather than how their remembered. The story is framed around John McCabe and Constance Miller, but the true star is the environment; the film brilliantly evokes a specific time and place, and immerses the audience in its specific atmosphere. There are so many details in the set design, the photography, and the supporting actors' performances that the central love story is almost unnecessary. And as I said, the love story is not really the point. The actual story would be rather unsatisfying, were it not for the lovely details the filmmakers throw at us, and the sheer pleasure of watching life in this environment unfold. 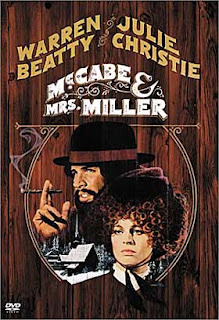 Much between Beatty's McCabe (the film's true lead) and Christie's Mrs. Miller remains unconsummated and unfinished right through to the end; these are not two people who were made for each other, just two people who encountered each other and saw some sparks fly. The actual plot, or what there is of it, involves McCabe and Miller's joint business venture - a whorehouse - and the events that take place when McCabe refuses to sell it. But as I've said, this film's pleasures are not in the plot but in the details, the little things here and there that give authenticity to this little Western town. I think the most notable aspects of the film (other than the Altman's signature direction and the performances by Beatty and especially Christie) are the production design, cinematography, and music. The town was apparently built from the ground up on location in western Canada using lumber from local trees, and the film just wouldn't succeed without a great town in which to shoot. Also, the film's distinctive grainy and softly lit look was achieved by "flashing" the negatives of the film after it was shot, a dangerous process that might've resulted in all the film being ruined, were it done wrong. It was all worth it, though, for the resulting film was rich and beautiful visually, with many impeccably composed and gorgeously lit shots. And the look of the film was perfectly complemented by Leonard Cohen's song score, which added poetry and lyricism to already wonderful visuals. Altman claims he didn't know what he was going to do for music while shooting; he'd put musicians in many scenes as a way of having diagetic music, but he didn't want a traditional underscore. Later, he realized that a recent Leonard Cohen album had songs that set the perfect tone for the film, and he added them in post-production. Between the soft, sad music and the film's distinctive look, McCabe had truly won me over in the first frames. I won't discuss individual plot points or performances, because that's honestly not what I remember about the film. What I do remember, and what I'll take from it, is a rich sense of atmosphere and a fully realized world, created by the director, actors, and designers together, with nothing feeling wrong or out of place. I think I preferred this film to M*A*S*H, due to its quiet confidence, cohesion and ease of sustained mood, but both are undoubtedly great. I'm so glad I took the time to investigate Altman... and I have a feeling the best in the marathon is yet to come. i wish i could do an altmanathon, but the only altmans i'll find on dvd at video stores here in brasil are m*a*s*h* and a praire home companion. i believe that now that he died his other films will be released here on dvd, but till then i just have those two. I don't understand why there isn't just a universal coding for DVDs, so you can order them from anywhere and play them anywhere. Is there actually a good reason for all the different "regions" and whatnot? But M*A*S*Hand Prairie are not a bad place to get started. I really respect M*A*S*H and get why it's so well regarded. I just wish I enjoyed watching it more. It's really not my favorite.